We had a cookout last night with a bunch of our friends - lots of yummy food and of course, lots of fun :) It was also a friend's birthday, so we celebrated with cake and ice cream. I made this recipe- Chocolate Chip and Sour Cream Cake, per the request of the birthday-person, and was happy with how it turned out. Preheat oven to 350 degrees F. Grease a 9"x13" glass baking dish with unsalted butter. Cream together the butter and sugar in a large bowl. Add in egg yolks and vanilla extract and beat together until well combined. In a medium bowl, combine flour, baking powder, baking soda and salt. "Sift" together with a wire whisk for about 20 seconds. Alternate adding flour mixture and sour cream to butter mixture. In a small bowl, beat egg whites until stiff peaks begin to form (1-2 minutes on medium-high speed). Gently fold in to batter. The batter will be super thick. At first I was kind of alarmed at how thick it was. But don't worry, it's fine. Scoop half of the batter into the greased 9"x13" baking dish. Use a spatula to smooth out the batter evenly in the dish. 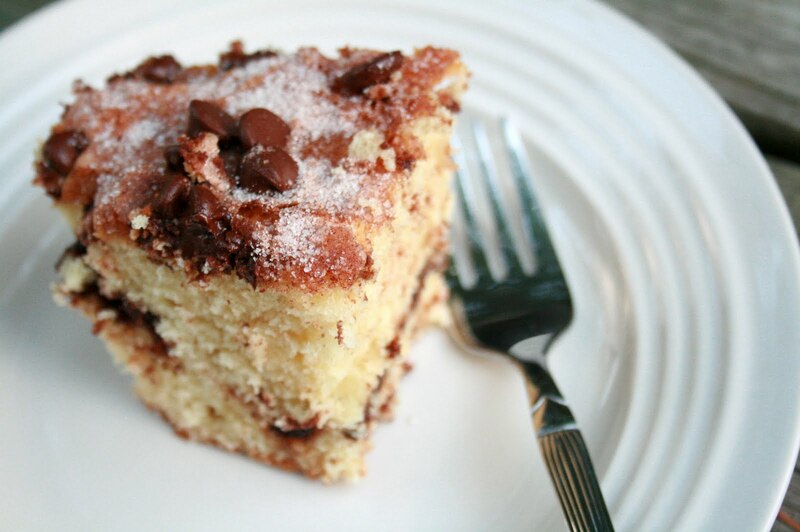 Combine cinnamon and sugar and sprinkle half of the mixture over the batter in the baking dish. 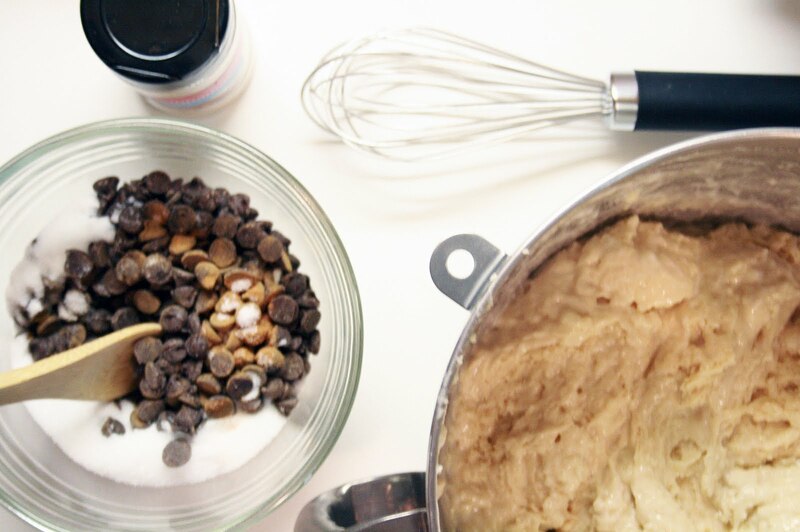 Then sprinkle 1 cup of the chocolate chips evenly over the batter. Scoop the rest of the batter on top and smooth over the cinnamon-sugar and chocolate chips (this part was tricky). 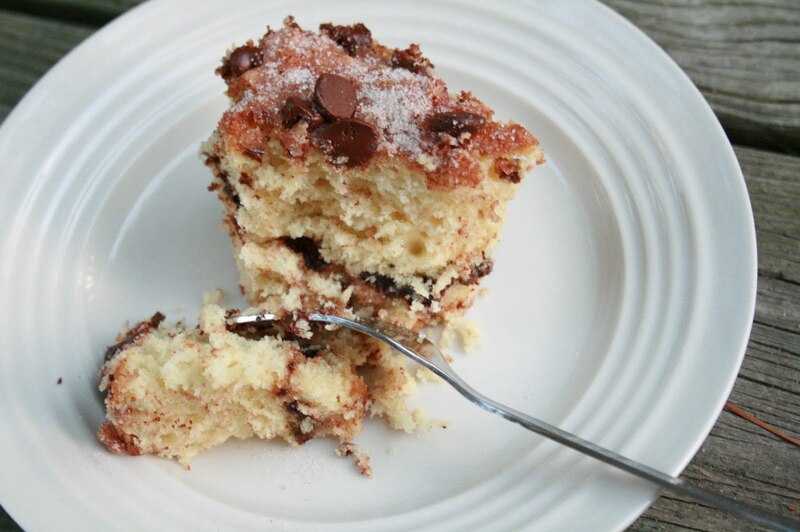 Sprinkle the remaining cinnamon sugar and chocolate chips evenly on top and press gently into the batter. Bake for 40-50 minutes until light golden brown and a toothpick comes out clean. Do not over-bake.